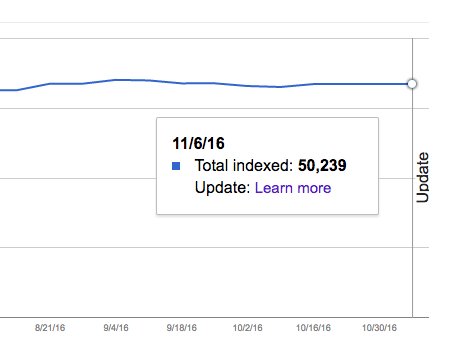 If you go to the Google Search Console and go to the "Index Status" report under the Google Index section, you will see on November 6, 2016 a line that reads "update." Normally that line means that Google made a change and the report might fluctuate. But when you go to the explanation page, which is at the data anomalies section, it says nothing at all new in the index status section for November. I did ask John Mueller what this is about and when I hear back, I'll update you all. Google fixed the glitch, in short, the update line should not have shown there. Update 2: Well, now the page shows an update but the line is still gone, more details over here.